Da, da da da (suppose to sound like trumpets)! The winner of my 100th post "Hooray for Spring!" giveaway is #14, Fitty's Pink Cottage! Congratulations! Just need your name and mailing address and I will ship out your prizes. Hey, that was fun! I want to thank everyone who left a comment. I wish I could send out prizes to everyone. You all are so sweet and I loved reading your kinds words. On Thursday I went over to Joy's house to help her get ready for the sale she is having today. We got a lot done. I didn't get any preview pics, but I did get a picture of our "we worked really hard and deserve this" snack. They were so yummy! It had been a really long time since either of us had one of these. 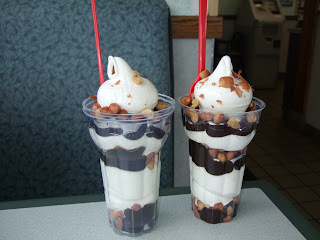 Wish I had another one right now. Here's something I forgot to show you. I bought this adorable little crusty pink bird cage from Cindy. Isn't it sweet? I plan on using this for a prop for ebay pictures when I finally get around to taking some ebay pictures. As I mentioned in my last post, yesterday I went thrifting and out to lunch with my lunch lady friend, Debbie. We had so much fun and we even found an estate sale where I found several cool item for really cheap. Click on the picture for a better view. 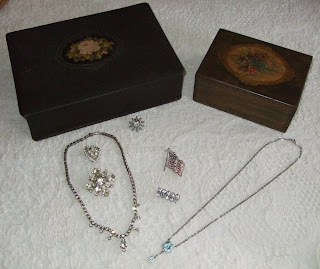 I also found these two adorable boxes and some vintage bling. This box was my favorite find of the day. 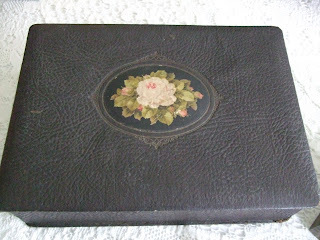 I found it in the carport of the estate sale. Not sure if it is a keeper or if I'll sell it. 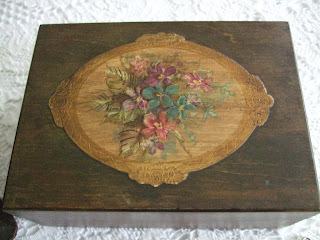 It needs a little tlc, but don't you just love the little rose medalion? This box I found at the Salvation Army boutique store. 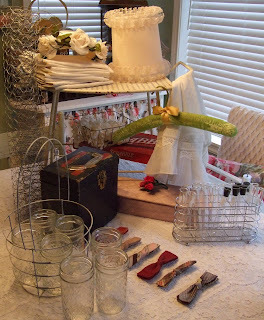 I found the adorable bow ties there too and the vintage hat with the white flowers which I have already plucked off. 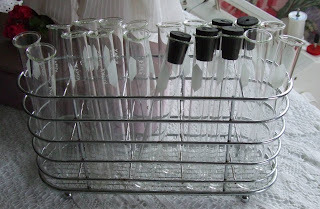 Debbie was kind enough to give me a box of test tubes. I have been wanting some for awhile. I have some ideas in mind for them, but look how perfect they are in this little metal rack I got for a dollar at Value Village. Today Isabel, my daughter and her friend and I are headed over to the 3 Friends sales. Should be lots of fun, but after that I really need to hunker down and get busy working on some projects. I have been having entirely too much fun lately. Hope you all have an awesome Saturday! Do something fun if you can. Love all of your beautiful finds! the pink birdcage is wonderful! gorgeous finds!! beautiful pink cage!! I'm like everyone else, I LOVE the pink bird cage! But I think I love those desserts the most! Mmmmm YUMMY!!! 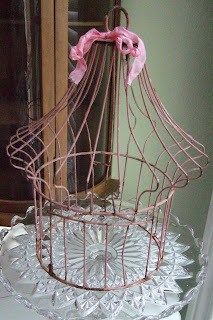 Oh what a sweet pink birdcage and fabulous thrifting finds. That was great seeing you today, I love being able to see my blog friends in real life! I wish I could spend each day having that much fun, but work gets in the way!! OMG Lisa you have to keep the box with the rose medallion - that is just too sweet!! Look at you! Love that pink birdcage, as I see a lot of others do, too! Those ice creams are making my tummy growl! Hope all is well with you! You have been having tons of fun with the girls!! !